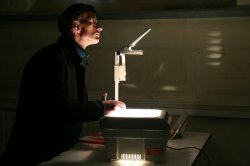 HARALD SMYKLA’s performance event utilises an overhead projector and monitor to facilitate his drawn pictographic notation of the film Metropolis. Smykla is a German artist based in London, and pictorial concerns inform the ephemeral, site-time, context-specific and often collaborative live art practice he has pursued since the late 1990s throughout Britain and Europe. 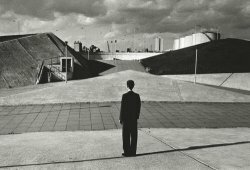 BRIAN GRIFFIN‘s iconic early images of London in the 1970s and ’80s emerged from his interest in German expressionist cinema and film noir. These mysterious photographs of isolated figures in the city are imbued with a surreal sense of the loneliness of the urban environment.JASON WALLIS-JOHNSON’s new silicone maps of cities extend an on-going series of works that reflect his literal obsession with maps and mapping. 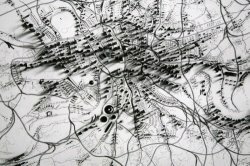 As with his drawings and light-boxes, these relief maps of London and other cities are made with extreme precision and delicacy, based on actual maps and population statistics.ALBERTO DUMAN subjects ‘postcard’ views of famous London structures to a process of textual substitution in his Views of London series. The urban landscape becomes a composite of text elements as each element of the photographic image is replaced with a text description that both resists and reconfirms the power of the iconic image of the city. 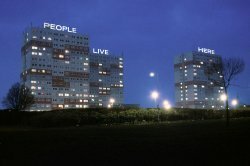 People Live Here is one of his projects to present ‘corrective elements within our contemporary social ecology’. STUART BRISLEY‘s After Pandemonium shows two floors of a devastated building in Canary Wharf after the 1996 IRA bombing. The original image comes from a newspaper photograph used as a reference—Brisley actually heard the explosion, but could only access the area visually via public media as it was closed to the public for some time afterwards. He ‘dissected’ his source photograph to produce a diptych that became a postscript to his other works related to the IRA/British conflict. JOHANNA PIESNIEWSKI studied in Germany and London, and her meticulous paintings seek out non-places and ‘hidden zones’ in the urban environment where man-made and natural environments meet. CHRIS KENNY replaces cartographer’s logic with an absurd imaginative system. In his three-dimensional collage-constructions, roads, parks, football grounds, dual carriageways, car parks and innumerable routes and places float and interact in unlikely combinations between disparate locations and associations. 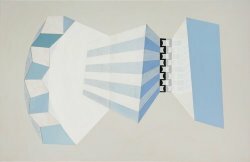 MORAG BALLARD‘s paintings evolve from her explorations of the constructivist language of Modernist abstraction. 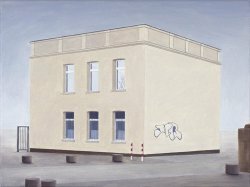 She works to understand and depict space, and a language of forms derived from the architecture of the modern urban environment is an integral part of many of her recent paintings which depict fictional, illusory architectural spaces. GEORGE CHARMAN‘s innovative print-based works are also concerned with the perception of architectural forms, and the exploration of perspective and surface illusions. MICHAEL BUHLER‘s white box constructions combine the everyday with the paranormal—anonymous pedestrians stroll through cipher cities, oblivious to hovering UFOs or the ominous underworld below them. Since the 1960s, Buhler has aimed ‘to minimize figuration and individuality as in graphic communication’ and his constructed images provide minimal yet evocative information.